The idea of this concept called Normal is one of the grandest illusions of our time. 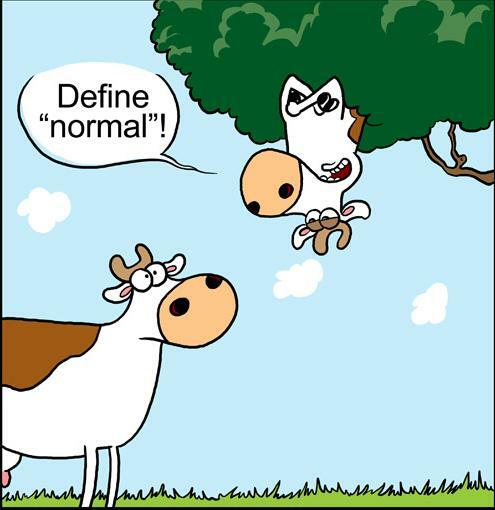 All definitions of normal are debatable—as are the definitions of typical, average, and ordinary. And what’s wrong with atypical, above average, and extraordinary, anyhow? Normal, apparently, means behaving like most behave. But who are these most? And how do they behave? Show me the model. And PLEASE don’t point to a television program. 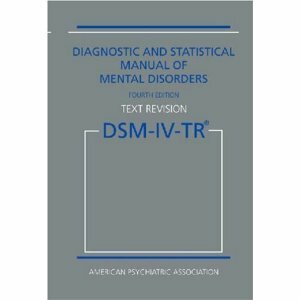 All mental-health practitioners in America categorize and diagnose millions of people by referring to the Bible of Abnormal—my word for the DSM. No surprise that the definitions of normal changes with each publication of the DSM. The new 5th edition of the DSM comes out in 2013, with newly proposed disorders and changes made to other disorders. It has been rumored that children tantrums will be a new disorder. What about adult tantrums? Because I feel one coming on! I’d like to see a Bible of Normal. I mean, if a whole thick book can list non-normalcies than shouldn’t the opposite book be available? Of course there is probably no profit to be made in a book on normal behavior, especially if the book were based on fantasy and trickery and not attached to a drug to cure normalcy. No big surprise considering the times we live in to discover the DSM is driven by the machinations of the pharmaceutical business. In fact, more than half of the experts who compile the DSM have ties to the pharmaceutical industry. (Published in the journal of Psychotherapy and Psychosomatics.) And other experts have other financial ties, such as research monies. Thusly, the current idea of normalcy is a spawn of the introduction of psychoactive drugs in the 1950’s. Hmmmm? I’m thinking I don’t particularly agree with how this normal came about. How about you? There is a direct relationship: Psychoactive drugs were introduced to treat the DSM definitions of Mental Disorders and Illness. A mental illness can be defined as: A psychological pattern reflected in behavior that disrupts a person’s thinking, feeling, mood, ability to relate to others and daily functioning. The illness cannot be overcome by willpower, and is not related to a person’s character or intelligence. In the majority of cases, mental illness usually strikes people in the prime of their life. The pharmaceutical companies would like everyone to believe that many people have a mental illness, but that FORTUNATELY the illness is a highly treatable condition; by (buy) their drugs, of course. 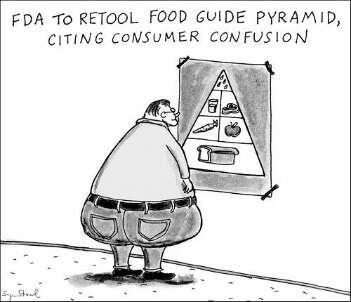 Too bad the direct relationship isn’t: The Food Pyramid, Employment Opportunities, Community Support Systems, Herbal Remedies, Acupuncture, Massage, and other healthy alternatives were introduced to treat the DSM definitions of Mental Disorders and Illness. Image found at above web page. You do know the powers that be in America do hope we get sick and fat so we will buy more drugs? Beyond the tantrum I just had over the injustice of the world, I am also a wee-bit confused about the DSM’s definition of Asperger’s Syndrome. The limiting definition is based on only male subjects. I’m a girl last time I checked. The definition is not based on a great degree of research. Yet, these DSM collaborators (insert any word here you want) feel confident and comfortable enough classifying Aspergers. People are born with Aspergers. It doesn’t just appear in the prime of one’s life. People with Aspergers do have high intelligence. I’m confused about this reclassification of Aspergers coming out in the new (and improved) DSM-V. Asperger’s might be classified as a social disorder. Please!?? So the people who act like everyone else are the ones without a disorder, the so-called normal ones? People who don’t express strong convictions are normal? People who suppress their quirks? People who are social conformists? People who blindly follow the presumed authority figures? If the definition of normal means to function in most areas of life successfully, what are these so-called areas? What is most? What does function mean? Do I function, if I come across as the norm? Feel like the norm? Believe in the norm? And please, please tell me what is success. If we could gather Gandhi, Mother Teresa, Martin Luther King Jr., Jesus, and other wise people, and ask them to explain their definition of success, I bet their success wouldn’t resemble most of what is portrayed in America’s normal media, advertisements, and entertainment. I’m done following the DSM’s and pharmaceutical companies’ yellow brick road of normalcy. It leads to the man behind the current stuffing his sacs with money. I’m happy with my own path. The path that leads to extraordinary!